There are videos on the Internet showing locks and padlocks being opened with great ease… is that really the case? Opening a lock without breaking it is possible, and many videos on the Internet demonstrate this. And it would appear to be very simple. But, to avoid getting the wrong impression, one should bear in mind that in reality things are much more complicated.Firstly, opening a lock with the lock picking technique is not at all easy. For this reason, someone who is able do it is often proud of themselves, captures it on film and uploads the video on the Internet. This is because it is a task that requires great skill, like diving from a high board or playing the violin. One can learn it, but it requires commitment, study, dedication, and lots of practice. 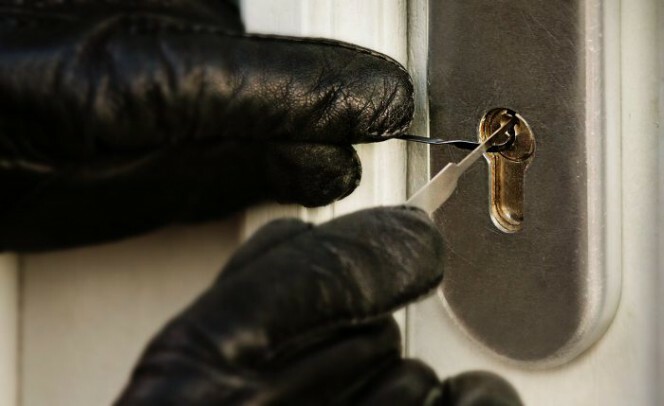 It is not something that you can improvise and it is not a widespread skill, so much so that less than 5% of burglaries take place using this method. The rest of the burglaries occur by passing through doors or windows left open or by breaking in using brute force. Secondly, if you look carefully at these videos, it can be seen that in almost all cases the locks or cylinders are held by hand, are well lit by a direct light and the individual carrying out the lock picking is in a peaceful and quiet room. Opening a lock whilst holding it in your hand is much easier than doing so when the lock is fitted in the door. In this way you are able to hear the sounds coming from the alignment of internal pins and you can move the cylinder or padlock as you wish. Lock picking is made easier under 3 conditions: silence, calmness and good lighting. It is quite another thing to open a padlock or a cylinder in a real situation, where it is not possible to hold and move it at will, and where there are noises and disturbing factors. And also, in the case of a padlock, possibly having to work in a very awkward position. For example, the padlocks of shutters are fixed to the ground, whilst in other applications they are often blocked by fixing rings or chains. In the case of padlocks used to lock up bicycles and motorbikes, the easiest and most effective thing you can do to prevent lock picking is to place the locks so they cannot be easily gripped and easily moved and that the lock is not immediately accessible. As common sense suggests, it is then advisable to avoid leaving the vehicle parked in a dark place, with few people passing by and where a thief can act undisturbed. 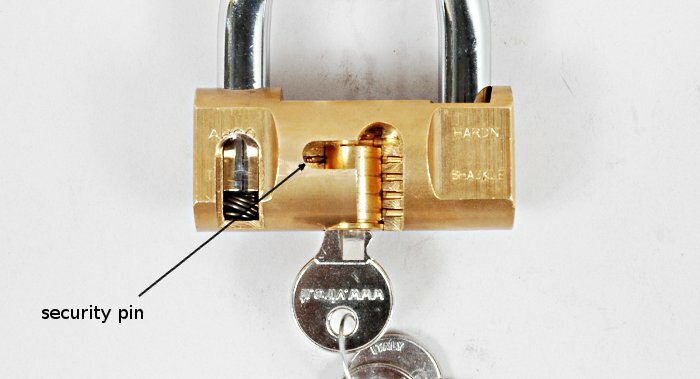 Lock picking consists in manually aligning the pins inside the cylinder, as would be the case when inserting the key. It is then possible to rotate the plug and open the lock. During lock picking each pin is aligned by means of the pick. 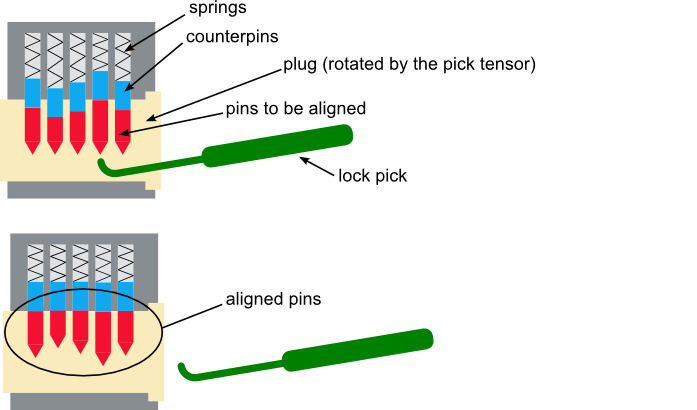 Since the pins must be aligned one at a time, the greater the number of pins the harder it is to open the cylinder by lock picking. 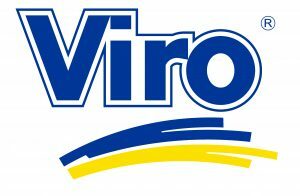 The best Viro cylinders have 7 pins, whilst basic models have only 4. The shape of the counterpins can be designed in order to withstand the action of the pick. Viro padlocks and cylinders use, for example, “mushroom” type pins (with the head and base larger than the cylindrical body) which, under the action of the pick, tend to get stuck between the body and plug of the cylinder, thus making lock picking particularly difficult. 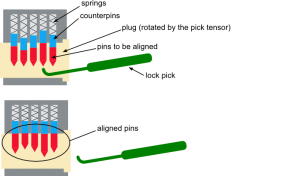 The counterpins with shapes different from the cylindrical one tend to get stuck when they are manoeuvred with the pick, thus hampering the lock picking operation. Lock picking exploits small inaccuracies and machining tolerances to “find” the correct position of the pins and align them. Opening by lock picking therefore becomes more difficult the greater the precision of the machining. For this reason it is better to purchase products of well-known and reliable brands, better still if made in Italy, where the quality of the machining is generally excellent, rather than items imported from Far Eastern countries. 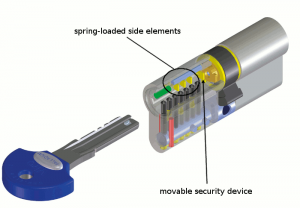 Having pins arranged on different planes, such as in the Viro cylindrical padlock or in the new Viro Palladium cylinder, not only deals effectively with key bumping, but also makes lock picking more difficult, as it multiplies the number of items to be aligned and makes it particularly difficult to align the pins on one plane whilst holding still those on the other planes. The Viro cylindrical padlock has a security pin on the opposite side to the pins. The profile of a cylinder is, in layman’s terms, the shape of the slot where the key is inserted. The more elaborate the profile, the greater its security, because it is more difficult to insert burglary tools in complex profiles. The most common profile, called “Paracentric” or “Universal”, has the classic rounded “S” shape, which leaves large enough spaces for the introduction and movement of burglary tools. More complex profiles, such as those patented by Viro, are, on the other hand, characterised by various acute angles or straight lines combined with each other, which make it much more difficult to freely move picks and other tools inside the plug. Of course, in order to achieve complex profiles a greater precision is required in the machining and a consequent reduction in the clearances, compared with the Universal profile; for this reason, poor quality products do not use elaborate profiles. Another advantage of security profiles is that the copying of the keys is usually controlled and it is therefore more difficult to make illegal copies. The common Parcentric or Universal profile leaves relatively large spaces for the introduction and movement of lock-picking tools. So, looking at a video on the Internet and concluding that opening a lock by lock picking is child’s play is like going to the circus and concluding that it is easy to be trapeze artist. It can be done, but is not as simple as it seems. Also, by knowing the risk, you can combat it effectively by choosing the right products, installing them in the correct manner and using them wisely. This entry was posted in Locks and Cylinders and tagged lock picking on 7 November 2013 by Mara Rossi.